We finally got ourselves moving. The study is back to where it was on 21 August, which is before the decorators undertook some sanding in the stairwell while leaving all the interior doors open. Yes, we weren't happy about that either. Everything has been taken out of the study, dusted and put back where it was. Very annoying and completely unnecessary if a couple of brain cells had been deployed. Meanwhile MOH's superior cleaning skillset has been deployed cleaning the new kitchen cupboards. The U-shaped part of the kitchen is almost-but-not-quite there so our plan is to move our kitchen things back into this part of the kitchen ahead of what we hope is the kitchen fitters final push next week (although we still need a firm date in the diary for that). Our thinking is that perhaps they don't think we're that fussed and can therefore be more flexible. In reality, it's really hard work cooking on a subset of kitchen equipment and "existing". We like to eat well and eat food cooked from scratch so we are beginning to get irked with this. I've run out of "cooked ahead" dinners, you know the sort where you purposefully cook more so you can freeze what's left for quick, easy and healthy home-cooked dinners during the working week. MOH calls these "leftovers" and I'm sure the people he works with don't get the full story. Now the cupboards are clean I'm willing to start using my new saucepans. 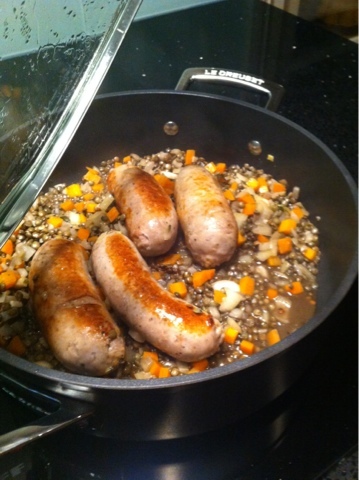 Tonight it's the sauté pan making its debut with sausages and puy lentils on the go right now. It's taken me slightly longer than I expected as MOH read the saucepan instructions and said they should NEVER be used at full heat. So I erred on the side of caution, perhaps too much caution but we're getting there now! I'm looking forward to some proper food! I'm serving this with some roasted butternut squash, accompanied by a glass of two of cider, which we picked up last year on a visit to Herefordshire. Definitely autumnal food.